If you’ve been reading here for any amount of time, you’ll know that I am kind of a huge believer in vegetables. Controlling my Type 1 Diabetes through the diet and healthy lifestyle habits is possible only by fully embracing vegetables in all their varied glory. In addition to that, I am a big believer in families all eating the same food. Camaraderie and compassion for each other’s health are good things to teach your kids. But…what if they don’t like vegetables? What if they are picky eaters? 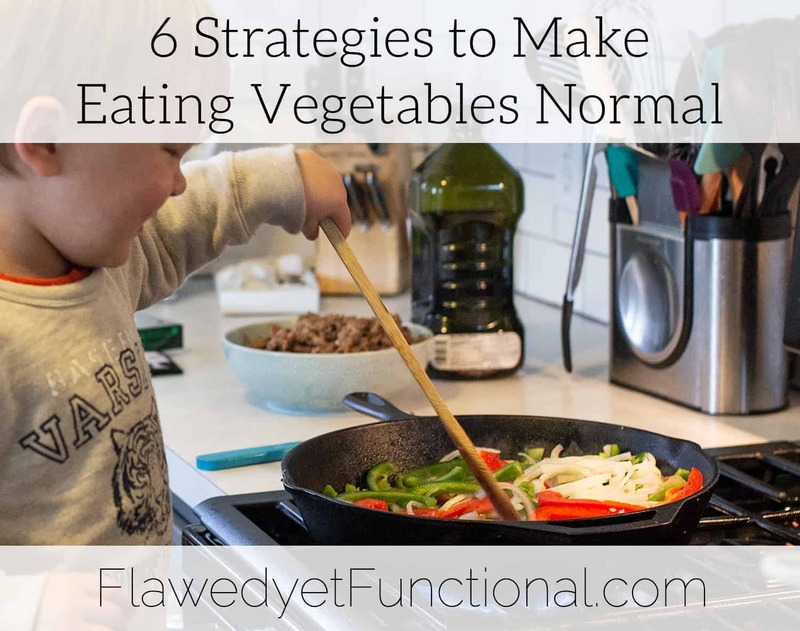 Even though I don’t consider myself an expert in this area, I’d like to share 6 ways that I make eating vegetables normal for my kids. Ok, maybe I should start out with this isn’t going to be easy. I think you already knew that, right? If you haven’t been eating vegetables regularly as a family, this will take work. I’ve been there too! When I began my journey toward eating a lot of vegetables, I was trying to count onions and garlic in my vegetable intake! I’ve come a long way, and you can too! First up, take your kids to the grocery store with you. Yes, it will take longer and you will likely be sweaty by the time you are finished, but the grocery store is where the education about vegetables and involving your kids in the food you eat begins. Take the time to tell your kids which vegetables you are picking out, how to tell what’s ripe, and how you plan to prepare them. Whet their appetite from the time you pick it up off the shelf! Guess what I’m going to make from these beautiful sweet potatoes??? Your favorite: sweet potato fries! Should we have them tonight for dinner?? Because my kids shop with me every two weeks, they are familiar with the process of picking out produce. Lately, my oldest has gotten in the habit of picking out a vegetable he doesn’t recognize and asking if we could buy it. It doesn’t matter if you don’t know what it is or how to prepare it (I’m stumped too sometimes!). The world wide internet can help you out with that later. Buy it, cook it, and then talk it up like crazy when you serve it. 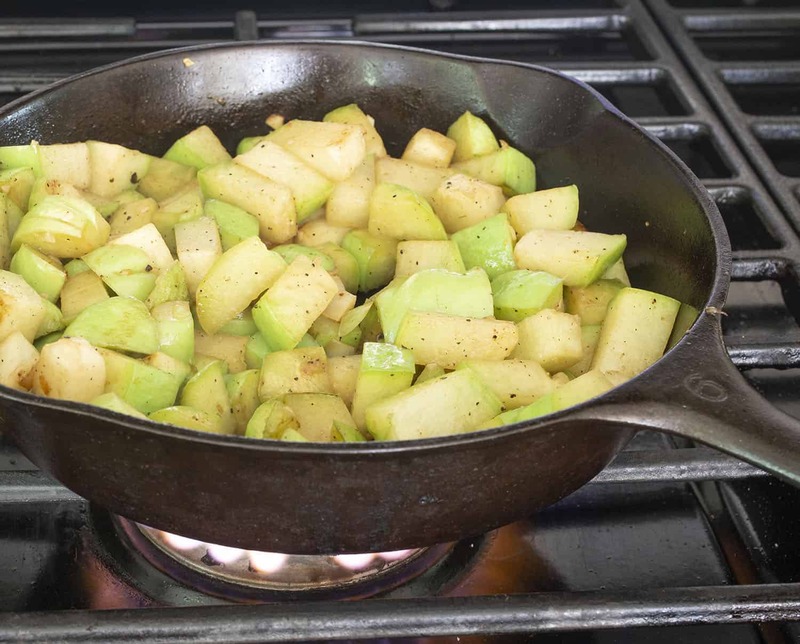 This is the Chayote squash that Jackson picked out for us! It’s a tart, crunchy squash that is going to go perfectly with our Mexican carnitas. Thank you for picking this out for dinner, Jackson!! Again, I didn’t say this was going to be an easy process. Little hands helping in the kitchen make for longer cook times and more clean-up. BUT how will our children know how to cook real food unless we take the time to teach them? I strongly, strongly believe children need to be in the kitchen. Their future health depends on it! What you say and how you say it when presenting kids with new food makes all the difference in the world. 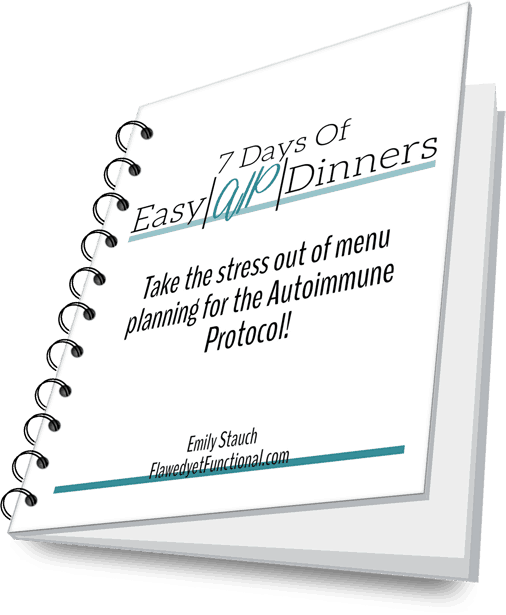 From the moment they begin eating table food (Remember, they understand WAY sooner than you think! ), present new food (actually, all food!) positively. Never say, “She won’t eat this. You won’t like this. This feels funny in your mouth.” Words like that will become a self-fulfilling prophecy. If you tell them they won’t eat it, guess what happens? They won’t eat it, even young kids. They are always listening to what you say! Today we’ve got stuffed acorn squash for dinner! It has your favorite meat inside, sausage! You know what’s great about this meal? You can eat the bowl! 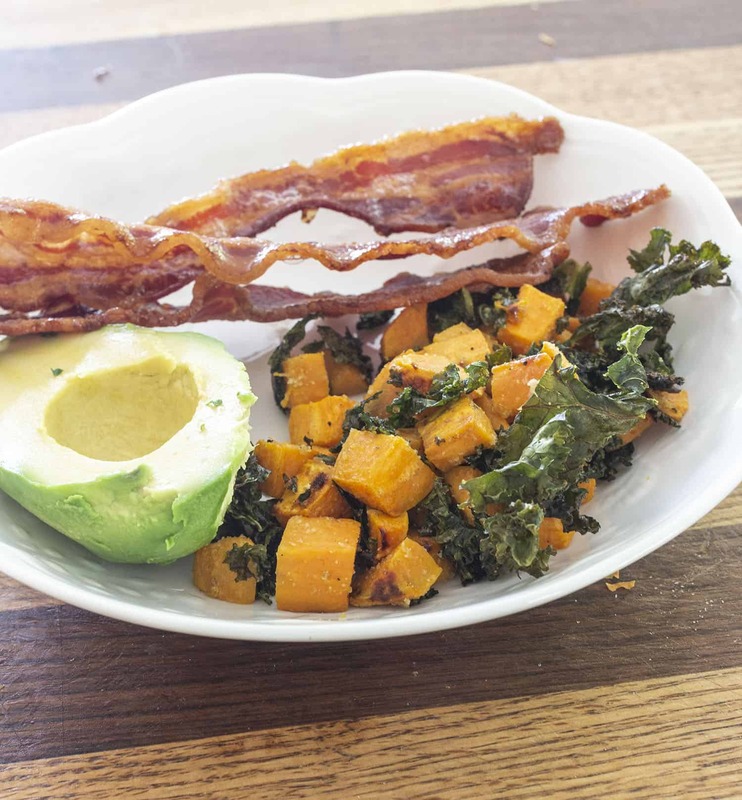 For breakfast today we’re having mommy’s favorite vegetables, roasted sweet potatoes and kale chips! Guess what I love about it? It’s crunchy AND soft. Aren’t those fun textures together? Time for your favorite, Judah, carrot fries! When you’ve finished what’s in your bowl, you may have more, as much as you like. Mommy made lots for you! Positivity is so important! Tell them truthful things about the vegetable, if you feel the need to prepare them for texture or flavor but pair them with positive statements. Assume they will like it and that they will want more. Eat yours happily and comment on how good it is. Because it is! God made our world full of a great variety of vegetables, and they are good! They do not taste like cupcakes, but that does not mean they are not good. Tell you children how wonderfully diverse this world is and the greatness of God’s creativity in providing all these wonderful vegetables for us to eat. Teach them to appreciate all the goodness we have to eat. A major part of getting kids to enjoy vegetables is to rid their palette of sugar and processed food. The ability to taste the sweetness in vegetables (yes, many are sweet!) is not over saturating our tongues with sugar constantly. Part of this involves our fruit consumption. Fruit is full of good nutrients, but it is also full of sugar. Sugar is harmful to the brain no matter the source of the sugar. Don’t overdo the fruit. Try serving fruit as dessert, once the kids have eaten their vegetables and meat. It will be doubly sweet to them after the vegetables and just might provide a good incentive to finish up a less than desirable dinner. 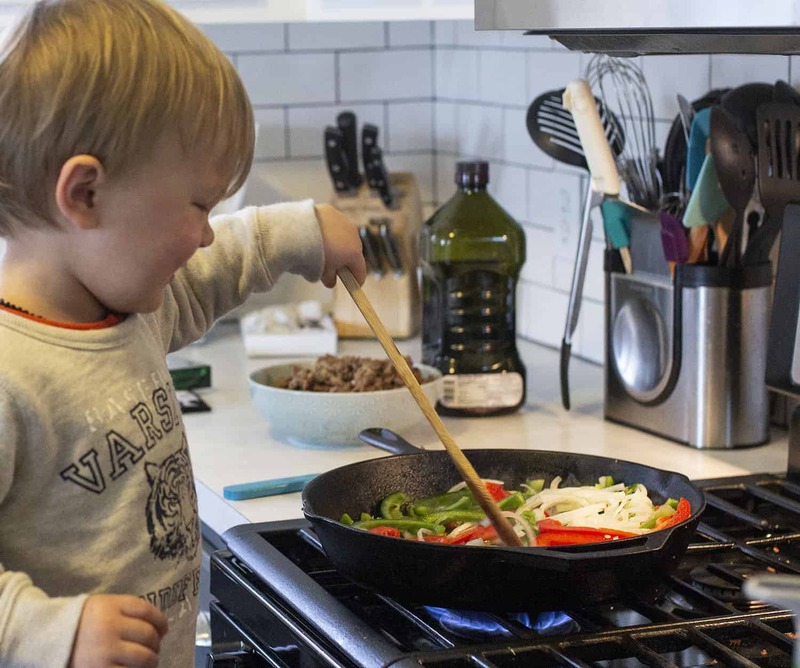 If you want your kids to eat more vegetables without fuss, it all starts at the grocery store and hinges on your positivity about the vegetables as you prepare, cook, and serve them. This is not an overnight process, and there will be days your kids refuse to eat what you make. You are not alone; I’ve been there too! Raising your kids to be vegetable eaters is just a piece of the parenting pie! Just keep working at it! Start with these six strategies to make eating vegetables normal for your kids, and see what works for your family.